This handsome trio provides a direct link to what I think of as the ancient past, because in the middle of the photo is Willie. Here he is about twelve, on holiday up here on the Northumberland coast. Willie is so important because, the boys tell me, he knew and lived with the greatest Dickens dog of all: the legendary Newman Noggs the First. Over the years there has always been a golden ribbon running from Old Noggsy (as he was known) and his Nortonwood genes and indeed it comes right down to little old me, a humble spaniel, because of my time with Uncle Jonny who knew and loved Willie so well, quite apart from being distantly related to him. When the Great Noggs died, Tommy Traddles was brought into the gang. He was the only one of the Dickens dogs to be that now-fashionable pale cream colour, earning him such soubriquets as the ghost dog. I think I should work backwards using our joint memories to help me write a bit about each of these boys. Please be patient: I will eventually get to Uncle Noggsy, and a life which started in Old Damson Lane, not far from the Jaguar plant in Solihull. Willie was wonderful: big-boned, furry, gentle, sweet-natured and enormous fun. Uncle Jonny told me that when he was just a little puppy on that holiday with Willie they had such a great time together – running, tumbling, letting go; every day was an adventure. I think it is generally felt that though Willie wasn’t a very bright crayon in many ways he shines brightest of all because he was simply so very good. He was a kind of saint – the Prince Myshkin of Dickens Dogs. He was born in the Black Country, in Tipton, laughingly called ‘the Venice of the Midlands’, one of ten pups, out of which litter one died. I expect he used to think about his lost litter-mate: I would have done. When he was collected in the spring, and was being lifted gently into the car, Old Noggsy gave a look of resignation and generously made room in his world, thereafter allowing the new family member to have whatever he wanted. He was like that. In fact, I have noticed how all golden retrievers share this exceptional open-heartedness. They are very kind dogs. Very content in their essential dogginess; very centred. Willie and Newman became a good team, moving around the country as lives changed: as a duo they were a by-word for reliability. 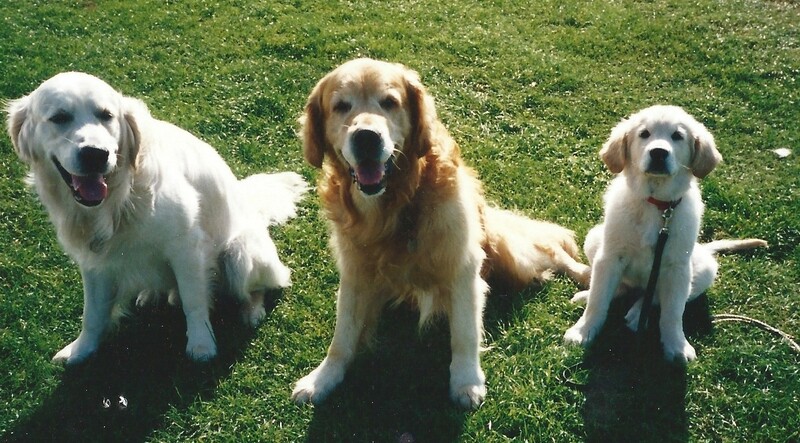 Indeed, like all goldens, they were always there! When Willie was two he took a funny turn and the vet said he had had an epileptic fit (I said he was like Prince Myshkin). Though he went on to have more from time to time, he didn’t need medication until he was about six. As it turned out he was really suited to the pills and the rest of his life passed without incident. He lived until he was nearly thirteen and to this day is the only Dickens Dog to have died in his own time: he had a heart attack and dropped down dead in his garden. It occurs to me that I could find out a bit more about coping with a dog who has epilepsy and write about it on my blog as everyone here knows loads about it. Willie’s greatest love was swimming and he was terrific at it. This was discovered when he was really young, on his first break away at the Devon seaside, one winter’s day when the wind was wild and the waves were rolling in. Because Uncle Noggsy didn’t like getting into water much, and certainly wouldn’t have ventured in under such appalling weather conditions, they were staggered when Willie became incredibly excited as they descended the steep path to the little cove. He gathered pace and began to bark in anticipation as the smell of the sea drew closer, much to everyone’s amazement, and when he finally got on the shingle he ran into the water, as though fulfilling his destiny. Astonishment! The size and ferocity of the waves concerned him not a jot: it was love at first sight! After that, though he didn’t live by the sea normally, whenever he got the chance he was straight in there, and was never happier than when joined by one or other of the family. 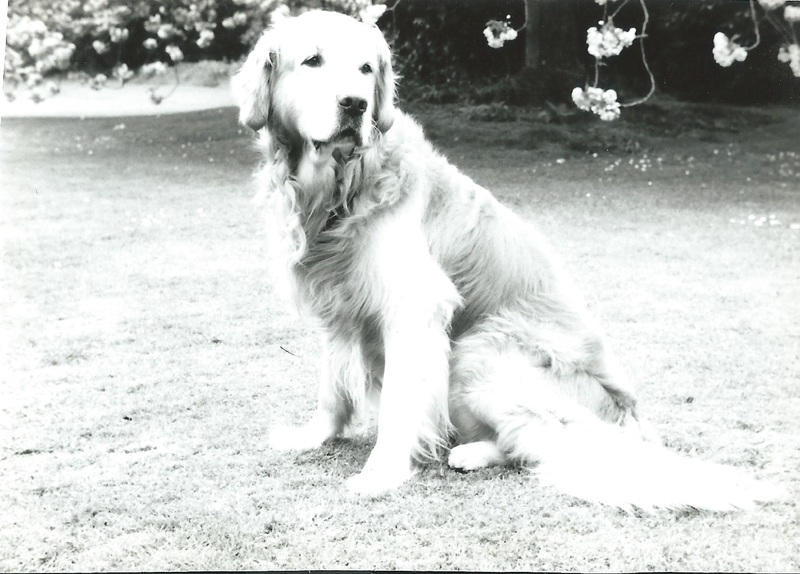 Willie had a lovely temperament, ever gentle and loving, every happy and positive – his simplicity and goodness are a lesson to us all: in no way could being more intelligent have improved him one little bit. Right to the end of his life, when his back legs had failed miserably and the arthritis made running an impossibility, he still leapt out of the back of the car ready for anything, having forgotten he’d only get about ten yards before his rear end gave way. It didn’t matter to him as he lived every moment to the full. He was a glorious golden boy and we will always remember him with enormous love. Once towards the end of his life, when his hearing and eyesight had deteriorated, a person who didn’t know him well got annoyed that his big frame was in the way in a narrow corridor and they smacked him for being there. There was much dismay and the person concerned eventually left the Dickens Dogs’ lives. Uncle Jonny never forgot that. He said it was a betrayal and one of the most indefensible acts he ever witnessed.